Juanita was already taking care of her 87-year-old mother when her husband had a heart attack so serious that he couldn’t return to work. The 60-year-old Newfoundland woman had been eking out enough as a personal support worker to cover living costs for all three of them — until her sister was diagnosed with stage four cancer. Juanita gave up more shifts to care for her sister as well. She fell behind on mortgage payments, so the bank threatened her with foreclosure. “At the time, I was stressed beyond...” said Juanita, who agreed to speak on the condition that HuffPost Canada only use her first name. That commercial was for Consolidated Credit, a debt management company that put her in touch with a mortgage broker familiar with refinancing for clients who are sinking under their mortgages. Juanita is a subprime client, someone whose credit history and income profile make her a less-than-desirable candidate for a bank loan. In order to avoid foreclosure, she has been forced into the shadow lending market, where lenders are willing to take on riskier clients in exchange for an interest rate as much as four times higher than what a prime borrower pays. In addition to higher service fees, the market is also weakly regulated, allowing lenders to take advantage of Canadians who are financially excluded, the estimated 20 to 30 per cent of consumers with limited options at traditional banks due to low income or a poor or non-existent credit history. New forms of lenders are lining up to benefit from Canada's credit boom, charging high interest rates to the riskiest of borrowers. The shadow lending market is growing faster than it can be regulated, leaving the most indebted Canadians vulnerable to what activists describe as predatory lending practices. Borrower Beware will examine who these borrowers are, why they’re forced to turn to the shadow lending market and how Canada can do better. Juanita opted to pay off the $56,000 owed to her first lender as well as prepay her mortgage for the next year in order to relieve some near-term stress as she tended to her sister, mother and husband. In order to do so, as well as pay all the fees required by the lender and broker, she required a loan of about $80,000 and an interest rate as high as 18 per cent. She is just one of the unknown but growing number of Canadians who turn to the alternative unregulated mortgage market. Banks have clamped down on mortgage qualification rules as the federal government announced six new mortgage rules since 2008. This effort to slow an overheated housing market has also been driving more Canadians into the shadow lending market. At the same time, the same low interest rates that are keeping prime mortgage rates at historically low levels are pushing investors to seek out investments with a higher return. Many are putting their money on alternative mortgage lending as a good bet, because the loans — backed by property — are more stable than the stock market. Although alternative lenders are not insured by the CMHC, mortgages in Canada are considered “full recourse” loans, which means the borrower is responsible for repaying a loan even in the case of foreclosure, unlike in the United States. That means lenders can take legal action to recover the money owed. It is also why many alternative lenders are often not the primary lender but will help finance second, third or even fourth mortgages. They are willing to provide loans to borrowers with just five per cent equity in their homes. Unlike banks and credit unions, which rely on deposits from other customers for capital, shadow lenders finance loans with money from groups of investors. Some experts worry that such lenders, who earn their money in fees from investors but take on little risk themselves, could be more inclined to dole out bad loans that are likely to default. A growing contingent of market watchers is calling for better monitoring and regulation of shadow banking activities. “These institutions are not subject to the same regulations and same standards in terms of reporting. There’s a lot more that can be hidden from the public, things that are not right could not be noticed early on,” said Michael Dolega, a senior economist at TD Economics. The Bank of Canada warned about the risks inherent in the shadow banking sector in its most recent Financial System Review last month. It had previously cautioned that, while shadow lending is a small segment of the market, stress in that space could trickle into the economy at large. “Owing to the less regulated nature of the shadow banking sector, opacity is a particularly important vulnerability,” it said. In other words: We just don’t know what these lenders are doing. The C.D. Howe Institute has called on the central bank itself to collect and analyze data to assess the level of risk posed by Canada’s shadow banking sector. Because the market is unregulated, it falls outside the purview of public scrutiny. Canada doesn’t have data on how many people turn to the shadow mortgage market or on how much those people pay in interest. Nor is there a way to assess the ethics of lenders. The mortgage lenders are provincially licensed, though authorities don’t set regulations. 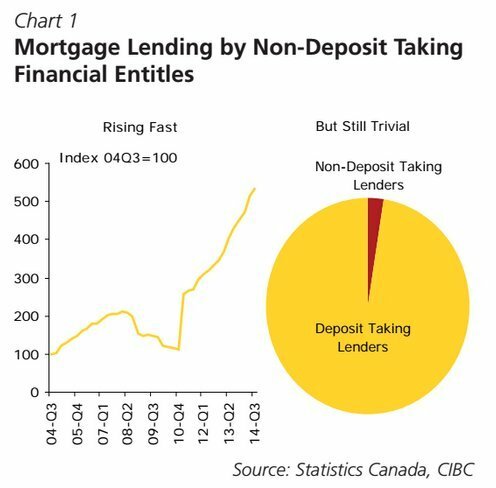 But a CIBC report from earlier this year noted that lending by non-commercial bank lenders has doubled since 2012. As of the third quarter of 2014, it was still rising at a year-over-year pace of more than 20 per cent, CIBC economist Benjamin Tal estimated. The shadow market is estimated to comprise less than 10 per cent of Canada’s mortgage market, a much smaller proportion than the 30 per cent estimated for the pre-crash U.S. market. But the prolonged low-interest environment — by encouraging more people to rack up debt — could foster faster growth in the next few years, and some believe that could have repercussions for the financial system at large if cracks start to show in Canada’s heated real estate sector. As illustrated by the 2008 financial crisis, relying on investments to provide credit is an especially unstable source of funding that can dry up rapidly in times of financial turmoil. Canada's alternative mortgage market, which had largely consolidated into three players — Citibank, Wells Fargo and HSBC — fled the country in the immediate aftermath of the 2008-09 recession as Canadian investors digested the extent to which shadow lending was implicated in the U.S real estate crash. All three of the large foreign players pulled out of the space in Canada. In recent years, however, as anyone who has seen those “no income, no credit, no problem”-type ads on billboards or public transit can attest, a number of smaller lenders have sprung up to fill the void. Mortgage lending has become so attractive that it is drawing in some unlikely lenders. Jewellery buyer Russell Oliver, better known from his ads in the Toronto area as the “Cashman,” decided to step into a new title — “the loan arranger” — after his customers started asking for help with their mortgages. The business is small but growing steadily. “Banks traditionally are very conservative, and if you can find certain ways of dealing with customers where they get rejected by the bank, it can be very lucrative,” Oliver said. Oliver has no qualms about being in the subprime business. He doesn’t dig into people’s lives, doesn’t care about their credit history or if they can prove their income. “Obviously it’s a very loosey-goosey way of doing it,” Oliver said about his qualification procedures. The interest rates he charges range from 10 to 35 per cent. His cut for connecting investors and borrowers is five per cent. His sole criteria is the value of the property that backs up the loan. Even then, he isn’t worried that a housing downturn could sink some of his customers into foreclosure because, while it would affect his investors, he has no skin in the game. He collects his fee and moves on. “We use other people’s money; I don’t put in a dime, I just work on a straight commission. 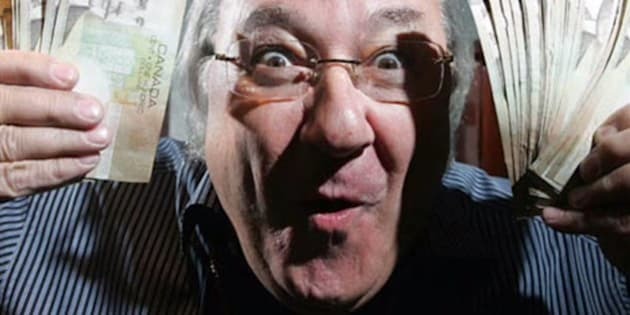 I don’t care what happens to the market, I don’t care what happens to the people, I don’t care what happens to the repossession of the house,” Oliver said. He believes some of his customers probably shouldn’t be seeking refinancing to hold on to their homes, but added that if Canadians are going to be so addicted to home ownership, he might as well cash in. “It doesn’t make sense to go to your jeweller for a mortgage or even for a car loan,” he said. While the market may be ripe for lenders and investors, it is the borrowers who carry the biggest burden, said BDO bankruptcy trustee Doug Jones. “Home ownership is something that people don’t want to give up on,” said Jones, who added that he sees people who have gotten into the alternative mortgage market on a nearly daily basis at his office. “What happens to people is, when they get into financial difficulty, the homes have been used as ATM machines because of the increasing values,” he said. The majority of people he sees who have multiple mortgages have been taking equity out of their homes to cover other debts. This has been made easier by high home prices, but if reports suggesting the market is on the brink of a downturn hold true, some homeowners could find themselves owing more than their home is worth, which is going to cause problems, he said. One of the major problems for borrowers wading into the alternative mortgage market is the usurious fees that can push people on the brink of bankruptcy even closer to the edge, including exorbitant fees for late or missed payments. And some borrowers are so desperate to get out of their current situations they’ll agree to terms that are not in their long-term interest. “There are some very unscrupulous lenders out there, there’s no doubt, who are just basically looking to take the home from you,” Jones said. Alternative lenders can work for some people as a short-term bridge to get them back into the prime lending market, but they can also help perpetuate a vicious downward spiral for those already in debt, said Jeffrey Schwartz at Consolidated Credit, the consulting firm that is working with Juanita to get her finances in order. He said people are too often emotionally attached to their home and refuse to give it up even when selling and downsizing or renting makes the most sense, he said. For Juanita, it is not a choice she could make easily; it wasn’t her own attachment to home ownership that kept her in that house. As indebted as she is, she can’t bear to part with the home that means so much to her elderly mother. She would do anything to keep the place her father built when her parents got married. Unlike some Canadians who find themselves turning to alternative lenders, Juanita did not get into this situation by spending frivolously or taking on more house than she could afford. “There was nothing differently I could have done,” Juanita reflected.